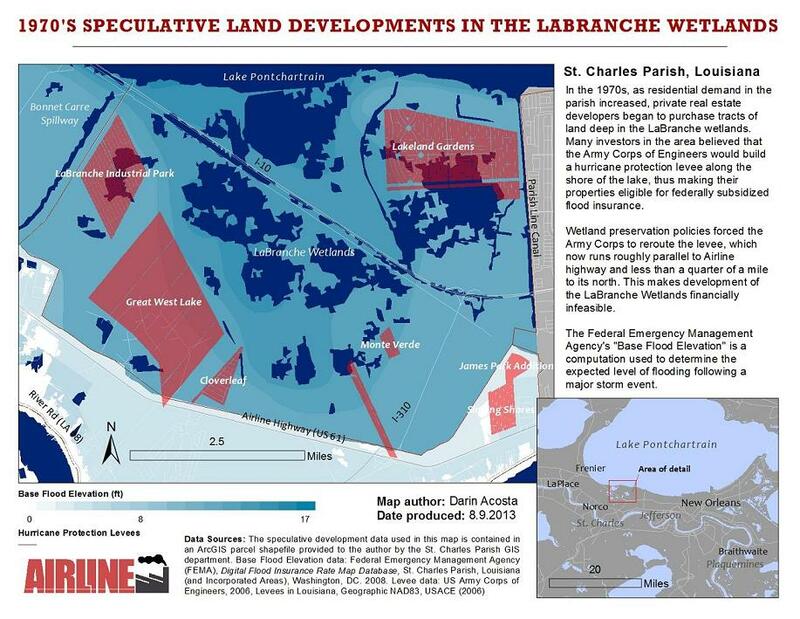 While Walker Land Company and other LaBranche developers were mired in this controversy, similar swampland suburbs were being constructed elsewhere along the lake, such as the subdivisions of LaPlace that now reach deep into the shoreward floodplains. The line between Jefferson Parish and St. Charles Parish is stark. Jefferson Parish, protected by the levee system, is thoroughly developed, with neighborhoods and shopping centers pressed tight to the parish line. St. Charles remains a wetland from Airline Highway to the shores of Lake Pontchartrain. The fast and loose nature of development throughout the postwar era reflects the general amnesia that our culture often experiences with regard to natural disasters. A few generations before this rampant speculation, in 1915, a hurricane came out of the West Indies that hit the Gulf Coast with force, spared New Orleans, and cut a line across Lake Pontchartrain. It built a surge as it bore toward the west side of the lake and exploded onto the German Coast with indescribable fury, annihilating the small settlements of Frenier and LaBranche. Survivors describe their elevated homes and fishing camps crumbling in the face of overpowering wind and persistent surges of water that climbed as high as 20 feet. Many sought refuge in a train passing along a nearby track en route to Harahan. The train moved slowly as it made its way east, blowing its whistle to gather survivors. Residents from all parts of the swamp struggled toward the vehicle in whatever manner they could, whether by boat or by swimming through the devastating waves. Soon, however, the eastern stretch of the track washed away with the onslaught of the storm. As the train began backing up in the direction of Hammond, the western track blew away as well, leaving the asylum seekers stranded on an island of track bed, huddled in the train cars, some kneeling in prayer with their knees submerged as the water continued to climb. They waited there through the long night as the squall lashed the world around them, until stillness slowly settled with the dawn. Those who were able to survive outside the train did so by hanging onto rooftops and trees that weathered the force of the elements. These lucky few gathered in a daze and ventured into the swamp to assess the absolute devastation of their homes, digging through submerged refuse to uncover body after body. They floated the corpses on improvised rafts to a graveyard in the forgotten village of Waggram. A small band of residents walked to New Orleans to alert a public that was completely unaware of the tragedy unfolding to the west. No structures in Frenier and surrounding communities were spared by the disaster. Over 275 Louisiana residents were killed, a large number of the casualties concentrated in St. Charles and St. John Parish. In 2012, Hurricane Isaac, following an almost identical course to the 1915 storm, deluged the German Coast again. We visited the Wetland Watchers Park on the shore of the lake a day after the storm passed. This was the very place where the small community of LaBranche once stood, and where the Walker Land Company envisioned their Bayou Beverly Hills. The sky was utterly clear as it often is in the wake of a major hurricane. The lake was still, the air sweltering and alive. Whole ridges of mud and detritus covered the landscape. Parking posts from the nearby boat launch had come ungrounded along with their concrete anchors and lay like helpless automatons paralyzed by the heat. We witnessed a more exaggerated version of this phenomenon a few days later while visiting Plaquemines Parish, where entire concrete tombs ungirdled themselves from the flooded earth and tumbled with the force of the waves, landing in unbelievable postures, some standing lengthwise against oak trees or jumbled in a heaping mess on the river road, half a mile from the cemetery. The concrete wasn’t enough to fasten these structures. The ground absorbed the water like a sponge until there was no easy distinction between ground and water. The subdivisions of LaPlace that reach into the floodplains of the lake were badly flooded as well. Piles of sheetrock and furniture lined each curb that we passed. Being that the land is a literal floodplain covered in concrete, the water stood in the streets for at least a day. We drove gingerly through the streets to avoid causing a wake. The aftermath was sodden and ugly, and possessed the familiar stench of Katrina, but a thought persisted in our minds, and in our conversations, and even in our footsteps as we crossed haphazard barricades of filth with heads pointed in deference to the exhausted residents that we passed. The ghosts of 1915 were with all who tread through the lingering atmosphere of Isaac, begging us to ask: what would the shores of the lake have looked like had the speculative housing developments of LaBranche been built?